Patron of the Katowice School of Economics. 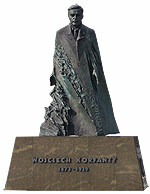 Wojciech Korfanty was a Polish politician and journalist. In 1903 he was elected to be a member of The Reichstag and in 1904 of the Prussian Landtag, from 1919 he was a Member of Parliament for the Republic of Poland. Known also for organising the Polish Silesian Uprisings in Germany's Upper Silesia and for policies which aim was to join Silesia to Poland. Wojciech Korfanty was one of the initiators of joining Upper Silesia to the new Poland after the war. On the 8th of October 2002, during the celebration of the new academic year 2002/2003, Katowice School of Economics was officially named after Wojciech Korfanty.